A cross between a baby-grow and a sleeping bag for roasty-toasty free-range camping. Pull on a Selk Bag and there’s a danger that you might get mistaken for one of those dodgy geezers that get their sexual kicks from dressing up as a baby. Yes, it is a baby-grow for adults, yes, it does make look slightly ridiculous, but somehow it is also a very desirable piece of kit. For a start, a quick modelling session in front of a bevy of sassy ladies had them cooing, “Oh you look so cute!” Certainly not a response we normally get when we are dressed in civvies. Looks aside its actually very practical. Sitting around outside the tent before beddy-byes in a Selk is not only toasty but means you can move around and not feel like a trussed-up turkey. If your hands get cold, zip them in. A horseshoe shaped zip runs around the end of the arm with pulls on the inside and out. Zipping and unzipping with hands inside can be a little awkward but not impossible. There’s also a hood with a draw-chord that closes around the face. Getting up in the middle of the night to relive a bloated bladder is also far more comfortable and practical in a Selk. There isn’t a traditional fly, but two zips that run from the shoulders to the hip on either side. Be careful if you flap them open for a leak, make sure they are well out of the way as the last thing you want to do is dribble inside your bag. There are pads of reinforced fabric on the feet. These wouldn’t stand up to a route march but are durable for padding around the house or a short walks in a grassy field. Two meshed backed vents on either leg that can be opened if you are too hot or to let out any dangerous build up of nocturnal flatulence gases. The ingenuity of a body suit is also its weak point – you would always be warmer in a sleeping bag of similar rating as your body will generate heat and keep your extremities snugger. 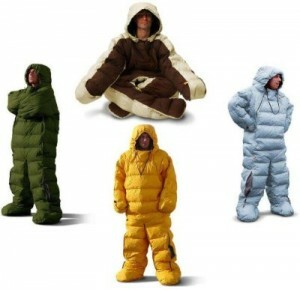 It might look daft but it makes sense – campers or couch potatoes – forget the sleeping sac, get a Selk.